Namaste offers a spa boutique, featuring a variety of local and regional products and gift lines, perfect for treating yourself or for holiday giving. In today’s age of wireless wonder, it seems that the very air we breathe is charged with invisible stress ions, making it increasingly difficult to unwind and escape the demands of the day. If you’ve ever wished you could put the world on pause, Namaste Spa, located at Marriott’s Barony Beach Club, invites you to do just that. More than just a place to get your muscles untangled, skin exfoliated, nails groomed, and eyebrows waxed, Namaste Spa provides a relaxing and rejuvenating experience—much like a mini-vacation—and that doesn’t happen by accident. According to Shay Moree-Dew, spa director at Namaste, every detail of the ambiance is intentional. “It’s meant to embrace you. From the big, fluffy chairs to the oversized robes to the Edison lighting, it really is almost like a hug. It invites you to escape from everything,” she said. The physical attractiveness of Namaste Spa is undeniable and will be further enhanced when the lobby and locker rooms get a makeover. “It will really sync up with our design, creating more of a flow,” Moree-Dew said of the pending renovations. Differentiating the spa, according to Moree-Dew, is the unusual blend of a large corporate foundation with the personal touches inherent to small business ownership. Affiliated with a Marriott resort, yet locally-owned by Christopher Gomez and Falko Langel, Namaste Spa offers the best of all worlds: luxurious resort amenities and high-quality therapeutic services, served with a generous helping of homegrown hospitality. “It’s in a Marriott, so you can access the amenities—use the indoor pool and Jacuzzi, come early and stay late. Even if you are coming in for an hour, you can make it a half-day spa day,” Moree-Dew suggested. 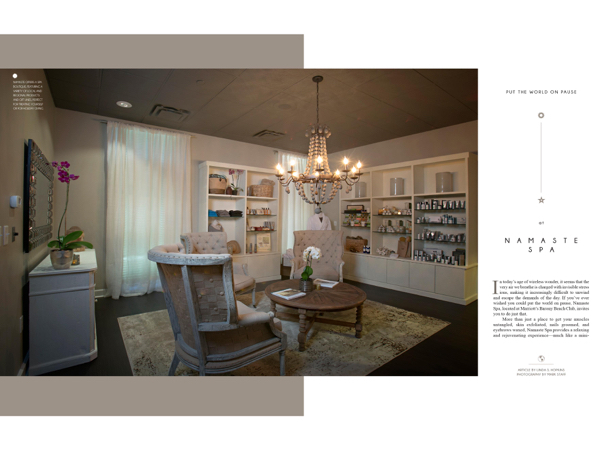 In addition to six treatment rooms including a couple’s suite and nail suite, Namaste offers a spa boutique, featuring a variety of local and regional products and gift lines, perfect for treating yourself or for holiday giving. The venue and service options are ideal for your individual enjoyment, time-out with a friend, an intimate celebration with your significant other, or a group event. The spa is equipped to accommodate groups numbering up to 20 and will customize the provisions according to your wishes. Namaste Spa is located at 5 Grasslawn Ave, at the Marriott’s Barony Beach Club. For more information regarding services, seasonal events and special promotions, visit namastespahhi.com or call (843) 785-2500 for appointments.